During the recent school holidays we decided to host a weeks teacher training, for some time we have seen that their is a need for more training to done in the area of learning disabilties and that we need a refresher course in the area of sign language. 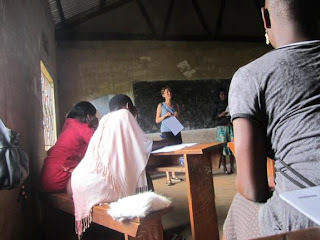 On the first day one of our children turned up to help the Sentogo Steven our sign language facilator from UNAD(ugandan national association of the deaf) with teaching the teachers how to introduce themselves it was a real blessing to have Emma come. At the end of the week we Steven Sentogo got each person to take an exam. At the end of the week, certificates of attendance where given out.